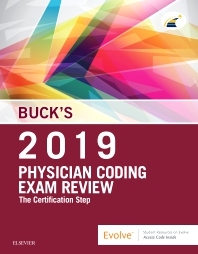 Prepare to succeed on your physician coding certification exam with Buck’s Physician Coding Exam Review 2019: The Certification Step! This extensive exam review provides complete coverage of all topics included on the physician coding certification exam — including anatomy, terminology, and pathophysiology for each body system; reimbursement issues; CPT, HCPCS, and ICD-10-CM coding; and more. Four full practice exams (answers and rationales included) simulate the testing experience and provide enough practice to reassure even the most insecure exam-taker. It’s the only physician coding exam review you need!